Clean Well Water Report: Which Well Water Treatment System is Better: Chlorinator or Hydrogen Peroxide Treatment? Folks – I have a question. I have sulfur odor (that rotten-egg odor) in my cold well water. One neighbor has an air system, that pumps air into his water, and it does get rid of the odor, but if he leaves on business trip, when he comes back, the odor is back in his house water. I think I have iron bacteria, because there is slime in our toilet tanks, so I want to use chlorine to kill both odor and bacteria. Which is better chlorine or peroxide do you think? What is the advantage of hydrogen peroxide as opposed to chlorination? Thank you for contacting us. We can definitely help set you up with a hydrogen peroxide system to correct your issues with odor and leave your cold and hot water smelling and tasting great. When hydrogen peroxide is added to water, it rapidly breaks down into its separate components hydrogen and oxygen. After the peroxide thoroughly treats the iron, odor and kills iron bacteria, there is no chemical residual left. Chlorine bleach is sodium hypochlorite so there is a small sodium residual added to the water after chlorine interacts with iron and odors. Hydrogen peroxide costs about three times the cost of chlorine bleach. After the peroxide is added, no residual disinfection agent exists in the water. With chlorine, it can be adjusted so there is some chlorine left in the water to continue to disinfect long distribution lines, or if there is a community system where a chlorine residual is desired or required. Generally, however, water treated with peroxide is great and has an excellent effect on water quality, making it taste and smell great. It is more powerful and more effective than chlorine if the pH is greater than 7. Chlorine is most effective if the pH of your water is less than 7, and when it is higher than 7, you have to use a lot more chlorine to do the job. 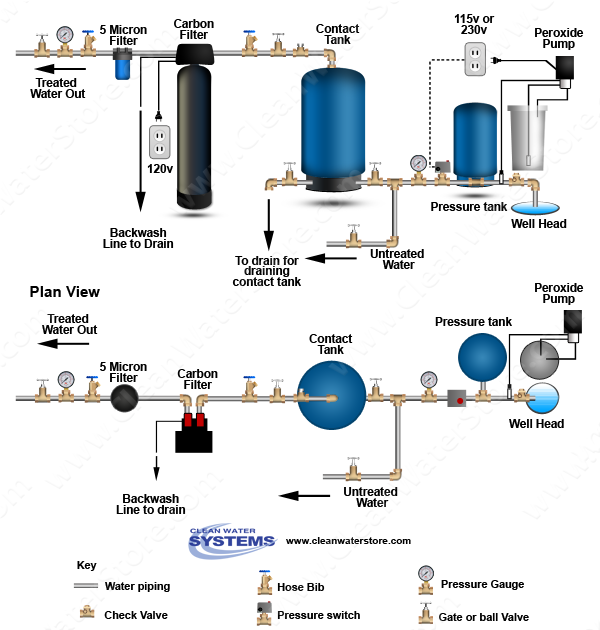 See this link to peroxide systems for well water odors here. 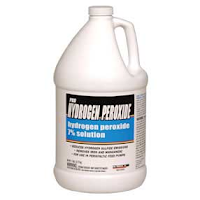 Out of the items listed on our hydrogen peroxide page, all are extremely useful and important, though there is some room for variation. First, you definitely would want the pump and solution tank package which will perform the actual injection of the peroxide into your line. This is crucial for the process, and the pump is actually quite easy to set up and install. 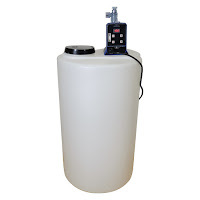 Additionally, you would definitely want the 40-gallon contact tank, because treating odors is not instantaneous- it takes some time for the reaction to take place. The contact tank allows adequate mixing time for the peroxide to do its job and neutralize the odors. If you do not have room for a contact tank, or you don’t want the expense of one, you can still use peroxide, but you will need to use more peroxide since there is less contact time after the peroxide is injected. We also recommend hydrogen peroxide itself, which we sell in 4-gallon cases. The peroxide has a 7% solution that is safe for drinking water. Some people choose to acquire peroxide locally instead so it is considered an optional item. The carbon backwash filter is also often considered optional, though extremely useful. The carbon filter is used to absorb any remaining or leftover traces of odor, while at the same time removing the hydrogen peroxide from the water as well. This results in very pure, clean-tasting odorless water without any added chemical. I personally recommend it very strongly, but once again, it is optional. 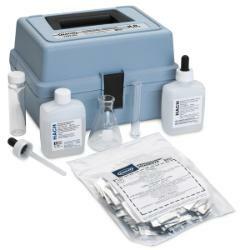 Finally, we also offer a high-quality hydrogen peroxide test kit for monitoring the peroxide levels. It uses a liquid solution and is highly accurate. Most customers do purchase this along with the peroxide system, though it is not mandatory either. Metering pump can deliver up from 0.5 to 22 gallons of solution per day and is fully adjustable to get just the right peroxide residual that is needed. Item Code: L1003620, Hydrogen Peroxide test kit as H202, Drop count titration type using Thiosulfate.